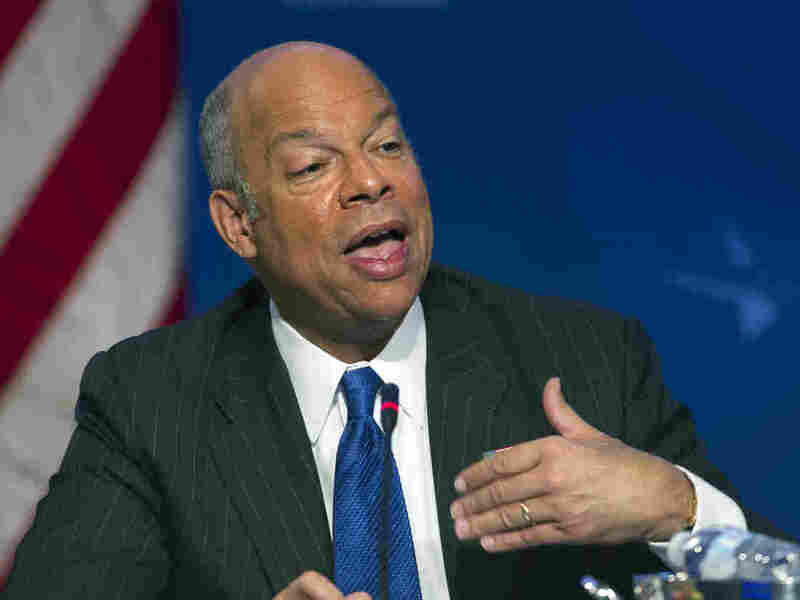 Homeland Security Chief: Threat To U.S. Malls 'A New Phase' For Terrorists : The Two-Way Jeh Johnson, speaking on CNN's State of the Union, said he is taking seriously a video put out by the Somali-based al-Shabab group calling on followers to attack Western shopping malls. Department of Homeland Security Secretary Jeh Johnson says a video released by al-Shabab "reflects [a] new phase" for terrorism networks. Secretary of Homeland Security Jeh Johnson says he's taking seriously a call by Islamist extremists for attacks on shopping malls in the West, including Minnesota's giant Mall of America. In an interview on CNN's State of the Union program, Johnson said a video released by the Somali-based group al-Shabab "reflects [a] new phase" in which terrorist networks publicly call "for independent actors in their homelands to carry out attacks. "We're beyond the phase now where these groups would send foreign operatives into countries after being trained some place," he said. At the end of a 77-minute video — focused mainly on the conflict between Kenya and Somalia and the deadly 2013 assault on a mall in Nairobi — an unidentified man hints that those sympathetic with the extremist group could hit similar targets in the West. "If just a handful of mujahedeen fighters could bring Kenya to a complete stand-still for nearly a week, then imagine what a dedicated mujahedeen in the West could do to the American or Jewish-owned shopping centers across the world," the man said. "What if such an attack was to occur in the Mall of America in Minnesota? Or the West Edmonton Mall in Canada? Or in London's Oxford Street?" Mall of America, in a statement released to Minnesota Public Radio, said it was aware of the threats. "We take any potential threat seriously and respond appropriately. We have implemented extra security precautions. Some may be noticeable to guests, and others won't be," the statement reads. "We will continue to follow the situation, along with the federal, state and local law enforcement and will remain vigilant as we always do in similar situations."